You are here: Home / family / Nurturing Helpful Hearts in Your Children (From Toddlers to Teens)! 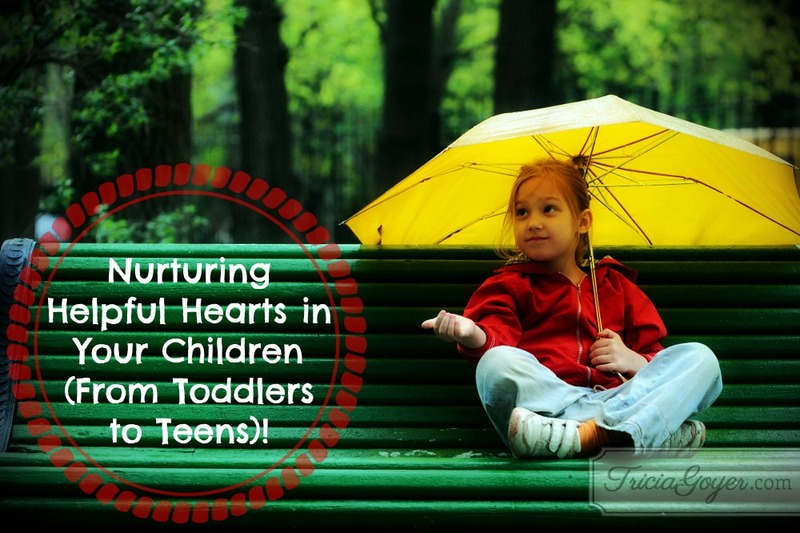 Nurturing Helpful Hearts in Your Children (From Toddlers to Teens)! Read a story about people who have helped each other (try Mark 2:1-5). Point out to your kids how kind and loving behavior is appreciated. Make one evening a week “Share-the-Load Night.” Tackle household projects together like washing the dishes, stacking wood, or helping the children clean their rooms. When you find litter in a public place, encourage your child to help you pick it up. Explain that you’re providing a clean area for others to enjoy. Make helping each other fun. With younger children, take turns buttoning one another’s coats. Let older children rake the yard together and jump in the leaves all they want. Have a “Big Helper” contest. Make a simple chart and keep track of family members who have helped each other. At the end of the week, reward all helpers with a family prize, such as an ice-cream outing. Help your child create “serving coupons” to give as gifts. A younger child could include coupons for helping Mommy sweep. An older child could offer coupons good for walking the dog or reading a story to his little sister. Each morning, encourage your children to think of one way they can help someone else during the day. At bedtime, talk about their acts of service and thank God for the specific ways they helped. Remind your child that praying is also a form of helping. In situations when we can’t physically assist others, we can ask God to help in his own special way. Teach your child that God is the best helper of all. Tricia, I L-O-V-E this post. Great ideas! Thank you so much, Andrea! Your comments always brighten my day! This is a great post. I cant wait to try your ideas. Thank you for sharing.